It’s no secret that I am a hater. Or at least a surface hater. That is, I am impatient, don’t like crowds, don’t like slow drivers, don’t like the people at the store who block the entire aisle or wait until their huge cartload of groceries is fully checked before getting out their debit card, or people who treat motorway onramps like that is the best possible place for viewing the scenery (i.e., going slow and not accelerating to the speed at which they need to go to merge). I don’t know why I am in such a hurry – but I just can’t fathom why other people are so myopic and inconsiderate – they go slowly (fine) but do so it seems largely because they think they are the only people in the store, on the road, in the world. Thus, I go through life a wee bit irritated, and I cope with this by making my little hate lists, or ranting briefly but not very seriously, about my annoyance. And then it’s done. Apart from this, I tried very hard today to keep things off the hate list. It was the most gorgeous day – warm, sunny, really indicative of why I live here. I had to go out to do a lot of errands, and I am not the biggest fan of Sunday driving in the country, particularly when the weather turns nice, Norwegians come to Sweden in droves – and worse yet, Germans and Dutch will soon arrive. But I kept my cool for the most part. I almost got mad in the grocery store because an old man kept getting in my way. But, despite not interacting with him, I tried to view him in a different light. He seemed to have gone to the store just to get out for a while – and in the end selected carefully and bought himself a bag of loose candy (which all Scandinavians seem to live for). Then he drove himself away at a snail’s pace in an old, original VW Bug. I had passed by the car in the parking lot wondering to whom it belonged (I was parked across the parking lot and had to put my groceries in the car and return my cart and somehow still ended up finishing before this old man got to the car). Once I saw him drive away – slower than slow – it was impossible for me to hate him. He probably owned that car since it was brand new (or at least that is how I like to imagine it). Imagining that he fired up the old car just to go get candy on a Sunday! This shift in perspective was quite conscious – and although we did not, as I said, interact, acknowledging his humanity made a difference. When I got home, I stumbled on an article that reinforced the same underlying themes. We all follow unspoken social rules and don’t generally make eye contact or strike up conversations with strangers – and I must say unequivocally that this is almost an absolute in Sweden. This article, however, examines some evidence gathered by behavioral scientists who contend that interactions with strangers improve our mood – maybe first by forcing us into a “pretend friendly” mode – but usually by the end of the encounter, the pleasantries and positive interaction has created genuine positive feelings. “One of the perks of being a behavioral scientist is that when your partner does something annoying, you can bring dozens of couples into the laboratory and get to the bottom of it. When Liz tested her hypothesis in a lab experiment, she discovered that most people showed the “Benjamin Effect”: They acted more cheerful around someone they had just met than around their own romantic partner, leaving them happier than they expected. When I lived in the US, it was common courtesy to acknowledge someone passing you on the street while walking past. Maybe not in a big city but certainly in small to mid-sized towns. I never liked it much, but I made eye contact, said hello. It was so ingrained despite my dislike for it that I continued to do it after I moved to Iceland – but quickly learned to stop because I was looked at as though I had said something deeply offensive or threatened the other person. I have comfortably filed right into the sheep herd here in non-confrontational Scandinavia – sometimes it’s sad but it’s how I have always been (as a shy person). I have always relied on other people (and you could always rely on Americans – or even other members of my family, who fall far afield of anything resembling shyness) to make the first move. Whatever the case, the casual can be difficult to deal with but I am actually a pretty sensitive, shy and loving person somewhere underneath. And when I do love I really love – whether that is a love for my friends, a partner or a cause. I become fiercely protective of those people and things. 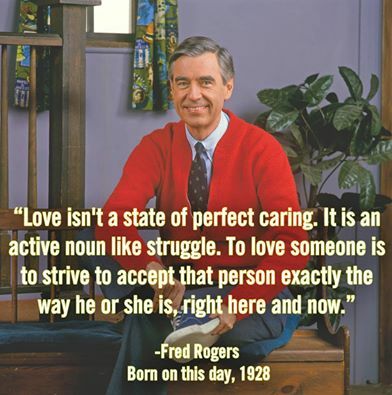 And, like the Mr Rogers quote above explains, I love actively – it is a constant state of accepting – I may not accept or like everything someone does, but that does not change that the love I feel is unconditional. I also love myself unconditionally, and sometimes that means that even if I do love someone, it is healthiest to move them out of my life – but even that won’t put conditions on how I feel about them. Their role just shifts. It is all very complex but at the same time strikes me as very simple – whether it is accepting and even embracing the idiosyncracies of strangers in public places and seeing them as more human or loving and accepting those closest unconditionally.